Al Qaeda in the Arabian Peninsula attacked two Yemeni military bases in a contested area of southern Yemen today, killing 32 troops and capturing several more after overrunning the outposts. The AQAP assault teams overran two bases in Dawfas and Al Koud, areas outside of the city of Zinjibar, the provincial capital of Abyan, according to The Yemen Post. At least 32 Yemeni soldiers were killed and 40 more were wounded in the attacks. A spokesman for Ansar al Sharia, the political front for AQAP, claimed they captured 28 Yemeni soldiers and seized one tank during the battles, Reuters reported. Today’s attacks took place just one day after the US killed Fahd al Quso, the wanted al Qaeda operative who was involved in the suicide attack on the USS Cole in 2000 and other terror plots against the US. Quso was killed in a US drone strike in the Rafth area of Abyan. AQAP has overrun several Yemeni military bases in the past several months. The biggest assault took place in Al Koud on March 4, when a large AQAP force attacked a Yemeni Army base that housed a mechanized battalion. The AQAP fighters overran the base and decimated the battalion, killing 185 soldiers, wounding 150, and capturing 73 more. AQAP also seized heavy weapons, including tanks, during the assault. The 73 soldiers were later released. On March 17, AQAP fighters stormed a military outpost in the town of Al Milah in Lahj province and killed 17 Yemeni soldiers and seized a tank. And on April 1, AQAP fighters overran an outpost in the Shibam area of Hadramout province, and brutally executed seven soldiers. 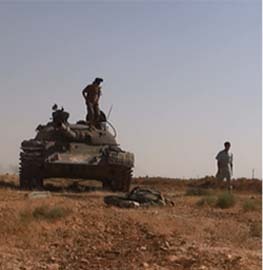 Also, in mid-April, AQAP fighters overran a military base in Lawdar and seized several tanks. The military claimed that more than 200 AQAP fighters, including foreign al Qaeda fighters, were killed as the terror group sought to take control of the city. AQAP has also assaulted other military bases in Abyan, Baydah, and Marib provinces over the past several months, sparking heavy fighting with Yemeni troops. The US has aided the Yemeni military with drone and conventional airstrikes, but the added airpower has done little to halt AQAP’s territorial expansion. AQAP has expanded its control in the south even as the US has ramped up airstrikes in southern and central Yemen. At the end of March, the coastal town of Radum in Shabwa province was the latest population center to fall to AQAP. 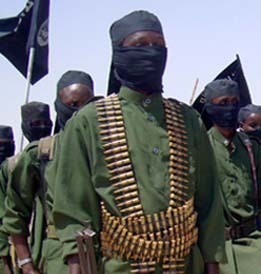 Al Qaeda in the Arabian Peninsula has been fighting under the banner of the Ansar al Sharia. 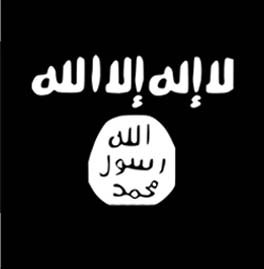 Ansar al Sharia constitutes “AQAP’s version of the Islamic State of Iraq,” which is al Qaeda’s political and military front in Iraq, a senior US intelligence official told The Long War Journal last year. “Ansar al Sharia is pulling in allied Islamist groups and sympathetic tribes into its orbit, and seeks to implement an Islamic State much like the Taliban did in Afghanistan and al Qaeda attempted in Iraq,” the official said. The terror group continues to use al Qaeda’s tactic of suicide bombings. In August 2011, Ansar al Sharia released a videotape of a suicide bomber attacking a Yemeni armored column as it traveled from Aden to Zinjibar. AQAP has taken advantage of the political turmoil in Yemen to seize control of vast areas of the Yemeni south. Since the onset of large anti-government protests in March 2011, AQAP has openly taken control of areas in Abyan, Shabwa, Hadramout, Marib, and Lahj provinces. 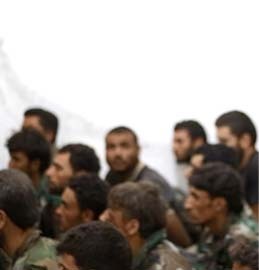 Government forces have withdrawn from several major cities in the south, leaving an opening for al Qaeda and allied Islamist groups to seize control of several areas. Zinjibar, Al Koud, Ja’ar, and Shaqra in Abyan province, and Azzan in Shabwa province are currently under AQAP control. AQAP seized control of Rada’a in Baydah province in January but later withdrew after negotiating a peace agreement with the local government. Yemenis have described the southern port city of Aden as ripe for an AQAP takeover. The US in turn has taken advantage of the security vacuum in Yemen to step up attacks against AQAP’s top leaders and its network. 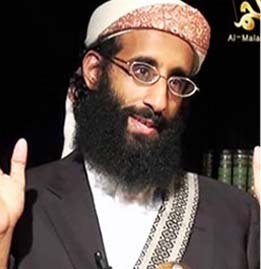 In 2011, the US killed two American AQAP propagandists, Anwar al Awlaki and Samir Khan, in a Predator airstrike in September 2011, and targeted AQAP emir Nasir al Wuhayshi and media emir Ibrahim al Bana. 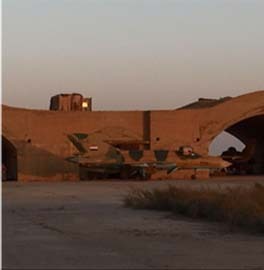 Wuhayshi and al Bana are believed to have survived the strikes. The drone program in Yemen was put on hold in October 2011 after Anwar al Awlaki’s son, Abdul Rahman, was killed in an airstrike that targeted al Bana. Abdul Rahman was a 16-year-old American citizen who had said he hoped “to attain martyrdom as my father attained it” just hours before he was killed, according to a Yemeni journalist. The air campaign was restarted in January, and intensified in March, when the US launched six strikes. The US launched six more strikes in April, and one more this month. There have been 14 strikes total so far this year. The US conducted 10 drone, air, and cruise missile strikes in all of 2011, and has carried out 27 strikes total since 2002 [for more information on the US airstrikes in Yemen, see LWJ report, Charting the data for US air strikes in Yemen, 2002 – 2012]. The pace of the US airstrikes has increased as AQAP has taken control of vast areas of southern Yemen. US intelligence officials believe that al Qaeda in the Arabian Peninsula poses a direct threat to the homeland. The terror group has plotted multiple attacks against targets in the US, including an attempt to blow up an airliner over Detroit on Christmas Day in 2009. These reports of attacks on bases outside of zinjibar seem to indicate that the Yemeni government claim of retaking central zinjibar last month was a gross exaggeration at best. Sounds like the Yemeni army is pretty pathetic. Fortunately for the saudis the most belligerent of the yemeni salafists are concentrated in the south of yemen and generally keep clear of the saudi border. There are a number of militant salafists near dammaj which is close to the saudi border, but these militants have been in conflict with the Shiite houthis for quite some time now. The saudis are thus content at the moment to seeing these two forces (who are both anti-saudi) keeping each other busy fighting one another. But if Saudi interests are threatened or incursions are made into saudi territory, they will readily attack and push back any aggressor as they did in late 2009 when the Houthis attacked siezed areas along inside the saudi border. It is well to remember that Yemen has a larger population than the remainder of the Arab peninsula, twice over. So the LAST thing the more northern Arabs want to do is get explicitly involved in Yemeni fighting. The shocking ability of AQ to attack fortified locations tells us that they’ve penetrated Yemeni security. Such ops may entail nothing more than buying off a trooper or two. The American media continues to hide the fact that Yemen is engaged in a bloody civil war with the Islamists and US military power is being used to install and defend the current govt. Yesterday’s report now confirms that at least 3 plots to attack the US directly have been planned and executed from Yemen, not Afghanistan, yet the Obama admin seems to be above criticism when it comes to its policy in Yemen. When will Congress act on a resolution to address White House policy in Yemen? It is only a matter of time (and chance) that an AQAP attack succeeds on the US homeland or on US bound carriers. It is becoming increasingly clear they have the motivation and technical means to do so. There have been at least 3 direct action plots/attacks that the US public is aware of…likely, there have been more. The American people are going to be outraged and demand why the US govt, after spending hundreds of billions of dollars over the past decade on ‘Homeland Security’, having their civil liberties violated every time they fly, pick up the phone or send an electronic communication, could not stop AQ terrorists executing spectacular attacks on the US.